Times of Malta 19/01/2014: The continental shelf is the largest and most valuable asset held by Malta. Its area is more than three times the size of Sicily and includes hydrocarbon and other mineral resources worth several billion euros. 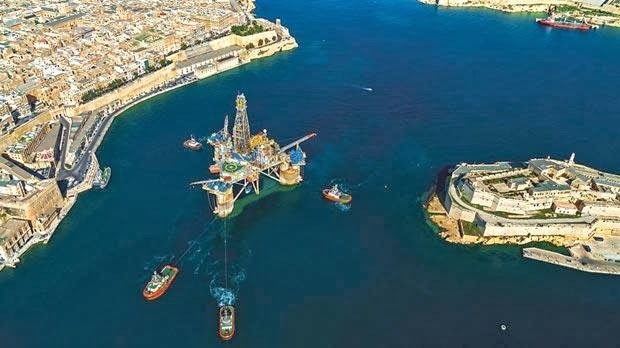 Despite rising oil prices, Malta’s unsuccessful oil exploration programme is characterised by decades of inactivity and several oil exploration licences that remain undrilled. Only 12 deep wells were drilled in 60 years, the lowest density of wells in the Central Mediterranean. Inexplicably, Malta remains the only European country without a national geological service that can assess and develop mineral resources in its vast shelf area. The 20 per cent probability of success claimed by the oil company that will shortly drill a well south of Malta is relatively low when considering that highly successful 3D seismics were used. This reflects a lack of geological research, aggravated by official secrecy on oil exploration data that keep Malta a high-risk, oil-exploration area. Malta’s continental shelf jurisdiction is the legacy of British colonial seabed surveys and the fathers of Maltese statehood. In 1966, prime minister George Borg Olivier enacted the Continental Shelf Act which decreed equidistant maritime boundaries. Later, prime minister Dom Mintoff embarked on an ambitious oil exploration programme. When the Medina Bank became...read on.